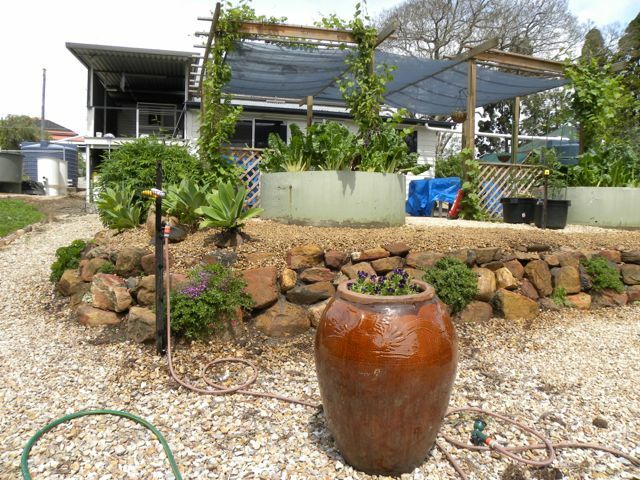 Creek Street Micro Farm was our first property purchase in Queensland. We had moved here from South Australia in late 1997. In October 2002, my partner Jan and I purchased the 3000 square metre “improver’s handicap” located in urban Bundamba. Comprising a run-down dwelling, hundreds of trees (most of which were invasive species) and a much larger number of fleas, we optimistically named the place Creek Street Micro Farm. In the ensuing ten years, we renovated the house, built a workshop/shed, removed the pest trees and messed about with the topography. Creek Street Micro Farm was located on a narrow block that sloped downward from the street – into a stormwater easement – and upwards again to the back fence. During the time that we were there, we set up aquaponic/aquaculture systems and kept chickens, ducks and quail for meat and eggs. We’ve also enjoyed the produce from a variety of gardening systems. In late 2013, we moved to Macleay Island.